Michalis Pazarzis is an Emeritus Professor of the University of Piraeus (Dept. of Maritime Studies. He graduated from Law School (Dept. of Law) from the National and Capodistrian University of Athens and from Panteion University (Dept. of Political Sciences). He was awarded his Master Degree from Panteion University and his PhD from the University of Piraeus. (Dept. of Maritime Studies). He has been a Professor, Deputy Chairman, Chairman and a Member of the Coordinating Committee of the Graduate Program in Shipping of the Dept of Maritime Studies of the University of Piraeus. He has been for many years member of the Athens Law Bar Association and he is now an Emeritus member. 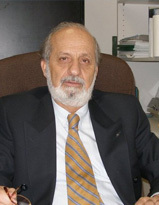 He also served as a Legal Advisor of the University of Piraeus Research Center and of ETBA (Hellenic Bank of Industrial Development), as a Consultant to the administrative board of ETBA, an Expert Consultant of the Ministry of Transportation and Communications, of the Ministry of Shipping and of the Ministry of Defense, and also as President of the Insurance Fund of Employees of Civil Aviation Agency. He has taught (in Undergraduate and Graduate level) Maritime Law, Marine Insurance, Commercial and Corporate Law, Private Insurance, Social Insurance, etc. in the University of Piraeus and in other Universities, i.e Neapolis University of Pafos, Open University of Cyprus, Piraeus Technological Institution (TEI), etc.